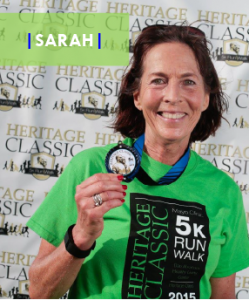 In her role as a nurse within Infection Prevention, Sarah educates others on environmental health, wellness and related activities. Her curiosity for research helps her to be open to new ideas. In the beginning of the year, her work group discussed their wellness goals for 2016. High priority initiatives include, participating in Energy Burst Videos, sharing healthy recipes, promoting upcoming health fairs & wellness challenges. Not to mention utilize their new Sit-Stand work stations approved by ergonomics. Where Sarah goes above and beyond is her ability to support and educate outside of Infection Prevention. She has been known to attend activities that involve her co-workers’ children, offering wellness support and encouragement. She has completed the Mayo Clinic’s Wellness Coaching Course and is working towards her Wisdom of the Whole Health Coaching Certification, so that she can further her reach in helping people find what health and wellness means to them.